Norwegian gold miners brought skiing to New Zealand in the 1860s. They used skis to cross the snow and reach the goldfields. Early Antarctic explorers also used skis. Their visits to New Zealand may have inspired people to take up skiing. Skiing became a sport in New Zealand in the early 20th century. In 1913 the first ski club was set up at Mt Ruapehu. Members of clubs had a hard climb to the slopes, which were often a challenge to ski. Huts were built nearby for sleeping and eating in. In 2006 there were 73 ski clubs in New Zealand. Members are expected to help look after the ski fields and huts. Today, skiing is more popular at commercial ski fields than at ski-club fields. It is also more expensive, but facilities are good. Tows or chairlifts take skiers to the top of slopes, and the fields are groomed to make skiing smoother. Snow-making machines are often used to make sure there is enough snow. 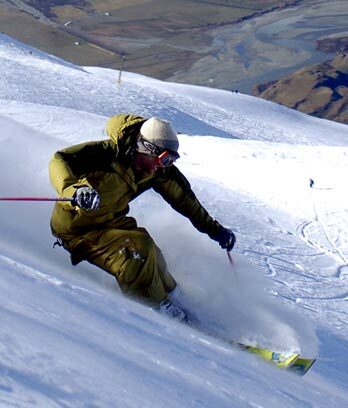 Major ski fields include Coronet Peak, near Queenstown, the Whakapapa and Tūroa fields at Mt Ruapehu, Treble Cone, near Lake Wānaka, and Mt Hutt in Canterbury. Snowboarding began in New Zealand in the early 1980s. Most ski fields now have areas set aside for the sport, and for freeskiing. Off-piste skiing is done outside established ski areas. Ski-field roads or lifts are used to get to the more remote slopes. Telemark skiing uses early skiing methods – the skis are narrow, and boots are fastened to the skis only at the toe. It takes place in mountainous country. Nordic or cross-country skiing involves lighter equipment and is done in flatter areas. Ski mountaineers ski across snow to reach a climbing place. Or they climb a mountain, carrying their gear, to reach a place to ski. This sport is popular around the South Island's glaciers. Ski-planes and helicopters fly skiers to hard-to-reach areas. The first ski races in New Zealand were in the 1920s. The first nationwide ski championships were held at Mt Ruapehu in 1929, and competitions between New Zealand and Australia began in the 1930s. Major international skiing events are not held in New Zealand. New Zealand ski teams regularly compete at the Winter Olympics and the Winter Paralympics (for disabled sportspeople).